Servlet tracing enables tracing for all ReportCaster servlets deployed in the web application, including the ReportCaster API. Servlet tracing provides information about queries to, and maintenance of, the Repository. This includes events that occur when a schedule is created. 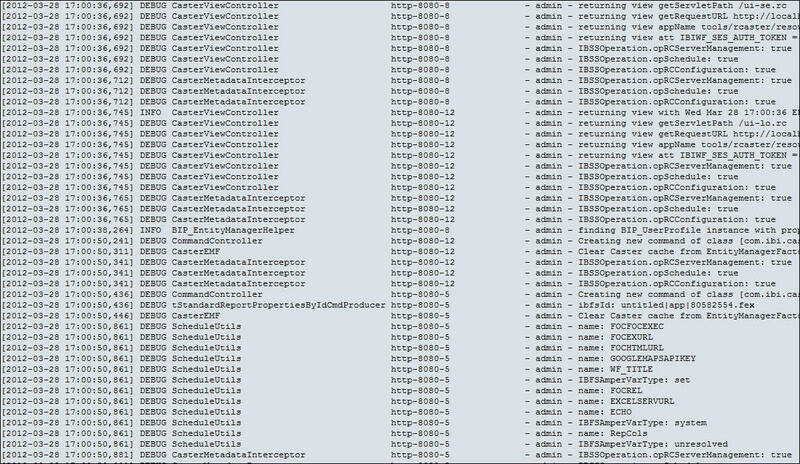 Note: You should also view the Application Server log files. By default, Apache Tomcat trace files are located in the \logs directory of the Apache Tomcat installation. If Apache Tomcat was installed by the Client, Apache Tomcat is installed under the ibi directory path. 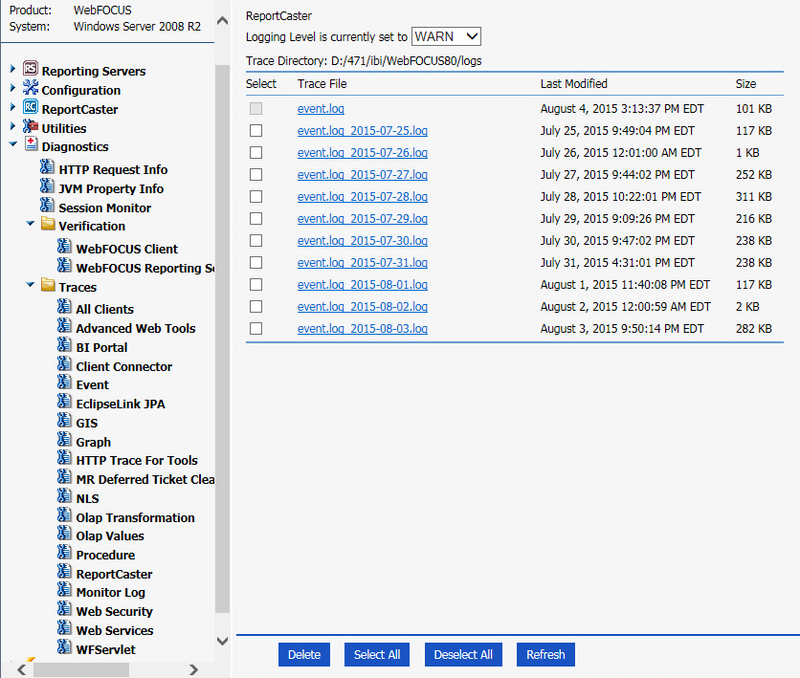 If ReportCaster is configured with Managed Reporting, you should also view the Client session trace files. In the Administration Console, you can access these trace files by clicking Configuration, Diagnostics, then Session Monitor. For more information, see the WebFOCUS Security and Administration manual. Navigate to the Administration Console. In the Traces group, select ReportCaster. In the ReportCaster Logger Level is currently set to drop-down list, select the type of information from the log file you would like to access, as shown in the following image. OFF. No information is written to the monitor.log file. ERROR. Logs information only if an error occurs. WARN. Captures only informational messages. INFO. Captures only informational messages. TRACE. Designates more specific informational events than DEBUG. Click the log file for which you would like to view traces. In this example, we selected the event.log file.